WHAT CAUSED MY TEETH TO TURN BROWN? DENTAL FLUOROSIS. This results from consuming high levels of fluoride in early childhood - a time when the permanent teeth are still developing inside the bone of the child. During the normal development of teeth, minerals such as calcium and phosphates are taken up by the tooth from the blood to form enamel and dentine. Other minerals such as sodium, potassium, magnesium, and fluoride are taken up in much smaller quantities. A combination of these minerals in their right concentrations within the enamel and dentine gives the tooth its normal characteristics. When fluoride is in excess in the body, it is taken up by the developing tooth, causing other minerals not to be absorbed in their right quantities. This makes the overall mineral content lower. Such teeth usually grow with a normal appearance or an overly chalky-white look, then with time turn brown because of the porous nature of such teeth, which tend to pick up stain from the food and drink we consume. WHERE DOES THIS EXCESS FLUORIDE COME FROM? Fluoride is a mineral found in the soil and in water. The levels vary depending on soil type and composition in a given area. For example in areas with volcanic soil, levels tend to be very high, and hence the groundwater in such areas will also have high fluoride. Since the soil has high fluoride, any food grown in such soil will also take up and have excessive fluoride. WHY ARE MY SIBLINGS TEETH NOT AFFECTED? Excessive fluoride usually affects permanent teeth at the stage where they are developing within the bone before the eruption- between ages 3 months to 6 years. 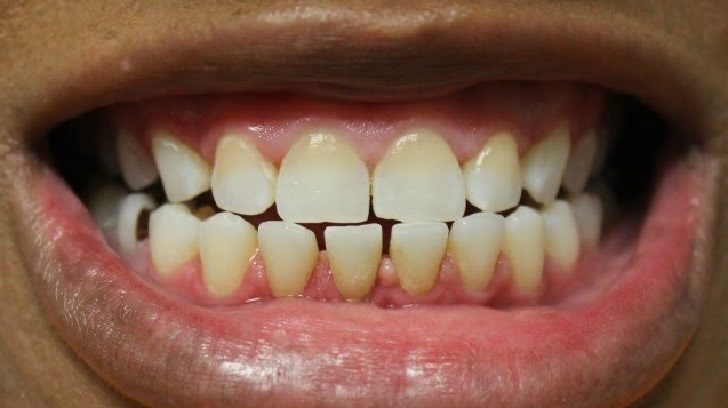 If your siblings moved to a high fluoride area after this age, then they will likely not suffer from dental fluorosis. IF FLUORIDE IS SO BAD, WHY IS IT IN TOOTHPASTE? The fluoride in toothpaste is actually good for your teeth as it strengthens them against tooth decay. Your dentist may even apply fluoride on your teeth if you are prone to tooth decay. The optimal level of fluoride in drinking water is also good for teeth and bones. HOW DO I TREAT MY DRINKING WATER TO REMOVE EXCESS FLUORIDE? Firstly it is essential to test your drinking/cooking water for fluoride levels especially if using borehole water or living in a high-fluoride area. Levels above 1.5mg/L are considered excessive. Excess fluoride in water can be reduced by use of special de-fluoridation filters. The ordinary commercial water filters do not remove excess fluoride. CAN THE BROWN STAINS BE REMOVED? Yes, there is a treatment for dental fluorosis. The severity of the condition will determine treatment. This is usually done for mild to moderate forms of the condition. Your dentist will take an impression of your teeth which will be taken to the lab to make a customized bleaching tray. You will then be given this tray and the bleaching gel and given instructions on how to apply it on the tray and how to fit the tray onto the teeth. It can take a few days to several weeks to achieve desired results. This is done where the surfaces of the teeth are rough or the structure of the front teeth is affected. The stained enamel and dentine are trimmed away and a composite material is bonded onto the teeth to cover or mask the remaining stain- restoring the normal shape of the teeth. This is in most cases the most predictable and esthetic option of treatment. It involved shaping the tooth on the front surface for laminate veneers or the entire tooth for a full-coverage crown. An impression is then taken and sent to the lab. The lad-fabricated veneers are then permanently bonded to the shaped teeth. Finally, it is important to prevent fluorosis where possible by avoiding the consumption of high fluoride. Where the condition is already established, please visit your dentist for review to discuss your options for restoring a beautiful, healthy smile.